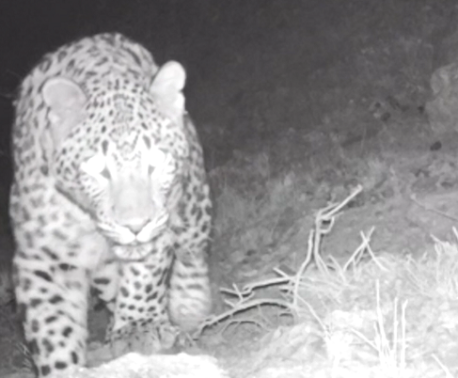 A conservation project to save habitat for the endangered Caucasian Leopard in Armenia has received more than 5,000 votes, confirming its lead in an online poll organised by the European Outdoor Conservation Association (EOCA). The project has been developed by World Land Trust (WLT) in partnership with the Armenian NGO, Foundation for the Preservation of Wildlife and Cultural Assets (FPWC). The project – Saving Armenia’s Leopard – is one of six projects competing in the EOCA poll’s nature category. The voting started on 17 March 2014, and to date some 14,000 votes have been cast. 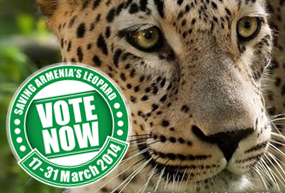 Saving Armenia’s Leopard has won 36% of the vote so far, but we are not complacent as there are still five more days of voting until the poll closes on 31 March 2014. The project that gains the most votes stands to win a conservation grant of €30,000 from National Geographic Germany (approximately £25,000), so there is all to play for. 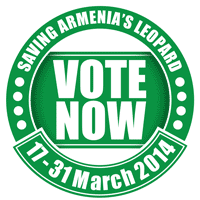 If you haven’t already voted for Saving Armenia’s Leopard, please do! And if you have voted, please encourage other people to vote as well. The conservation grant will make a real difference to Caucasian Leopards, now thought to number fewer than 15 in Armenia. WLT has entered projects in EOCA polls in previous years, but so far no WLT project has been successful. In 2011, WLT backed a project to protect the Kinangop grasslands in Kenya, a vital habitat for migratory European birds and the global stronghold of the endangered Sharpe’s Longclaw. In 2012, WLT put forward a project to save Fuertes’s Parrot from the brink of extinction in the rainforest of central Colombia, and in 2013, it was the turn of the Palkachupa Cotinga, an endangered bird clinging for survival in a remote alpine area of Bolivia. But this year, the voting seems to be going our way and WLT’s project to preserve habitat for the endangered Caucasian Leopard is clearly resonating with the public. In 2014, WLT’s 25th Anniversary Year, let’s make sure we win our first EOCA poll. WLT supports other conservation measures in Armenia, including providing Keepers of the Wild funding for rangers in the Caucasus Wildlife Refuge. 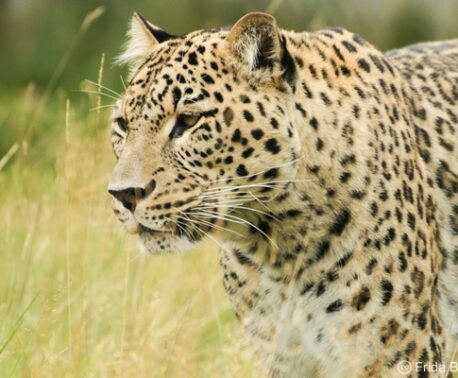 WLT is also raising funds for habitat conservation in the South Caucasus with a special appeal, Save the Caucasian Leopard.